/ Latex Gloves - Powder Free / Eudermic MP 12"
The comfort, fit, tactile sensitivity and durability of a well-made powder-free latex glove is unsurpassed. These Medline latex gloves are thick and great for use when heavy-duty protection is desired. Latex gloves are often preferred for procedures that require greater dexterity. Whether you're looking for economy or advanced technology, Medline's wide selection means you'll have no problem finding the right latex glove for you. 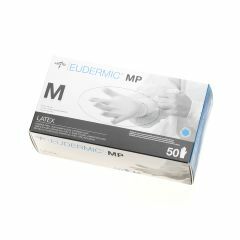 AllegroMedical.com presents The Eudermic MP 12" High Risk Exam Gloves. The comfort, fit, tactile sensitivity and durability of a well-made powder-free latex glove is unsurpassed. These Medline latex gloves are thick and great for use when heavy-duty protection is desired. Latex gloves are often preferred for procedures that require greater dexterity. Whether you're looking for economy or advanced technology, Medline's wide selection means you'll have no problem finding the right latex glove for you.